I’m on new fertility medication that makes me so nauseous that I take it right before bed. I’m so busy at work there’s no way I can sneak away for an insemination. Not going to happen. I’m hoping that my cycle will be longer than usual and maybe I’ll ovulate over the weekend instead of right in the middle of my work week. If I ovulate during the week, then we’ll just have to do it the old fashioned way and pray. 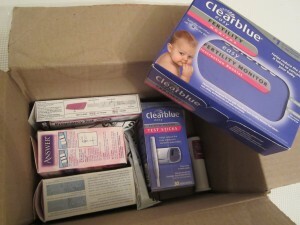 A friend of mine was so sweet to FedEx me all her fertility supplies. Like Christmas in the middle of the summer! Big fan of the PreSeed!